Ron Locke knows he pitched for a Hall of Famer in 1964. However, did he think Mets skipper Casey Stengel was anything like the zany character reporters claimed? “I thought Casey was a great man. He liked young kids coming up from the minors. he liked talking to young ballplayers to see what they knew about the game. “But as far as a manager, he thought he had the Yankees. He liked to drink booze and staying up late at night. He really didn’t tell you much about the game. A card of one meant gum for all in 1955! Steve Kraly is more than a member of the 1953 New York Yankees. He’s a baseball legend in Binghamton, New York. His record-setting season of 19 wins and 19 complete games got him his promotion to the majors. He’s been official scorer for the Binghamton Mets so long that fans honored him in 2008. In fan voting, Kraly was the winner in the team’s “Choose the Next Bobblehead” ballot. He didn’t take the honor lightly. At the game’s bobblehead giveaway, he spoke briefly to the crowd. 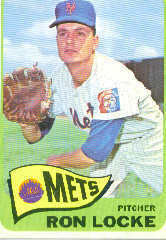 Kraly lives in hobby infamy as #139 in the 1955 Topps set. He says that “$2,500 and a case of Topps bubblegum” were payment for his appearance. I asked if the facsimile signature is simply reproduced from the contract he signed as a minor leaguer. Nope. He remembers signing a facsimile card for the signature reproduction. Kraly’s voice swells with pride as he tells of being selected by Topps to be part of the “Authentic Signature” series in the Heritage set. Kraly remembered that he was asked to sign only 50 of his 450 cards in red ink. The Children’s Home once served as an orphanage. Kraly’s late wife Irene was one of many children benefiting from the home’s services. In her honor, Kraly benefits the Home. Kraly’s fondness extends to Stengel. “The best manager ever,” Kraly says. “He treated everyone equally. 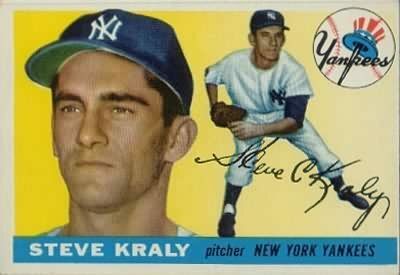 At that time, there was just eight teams in each league.” If an arm injury (blood clot) hadn’t short-circuited his career, Kraly thinks he could have been a part of the Bronx Bombers for 4-7 years. Kraly pauses. His tone changed. “Now, there’s 30 teams. But there’s not that many good major leaguers. Today’s players are spoiled.” I imagined Kraly’s harsh assessment of current autographing habits and fan relations. More than a half-century later, the fan mail still comes. One letter Kraly received was from Kenneth Hogan, a New York City firefighter. Hogan wanted some information for the book he was writing: Batting 10th For the Yankees: Recollections of 30 Yankees You May Not Remember. Kraly called Hogan. They spoke. The former pitcher was so pleased with the finished results that he offers ordering information for the title. Anyone who writes to Kraly will remember him. Crisp handwriting, with every letter legible. Know that your letter will get read. One way to offer your thanks in advance for Kraly’s guaranteed reply would be shown by sending the lefty a dollar or two with your letter. Earmark the donation for the local children’s home. The veteran pitcher’s wife has passed away, but the love hasn’t. Kraly is still pitching for Binghamton’s kids — including the girl named Irene. Coming Friday: Why Harvey Meiselman’s 2011 baseball address list is the best yet. 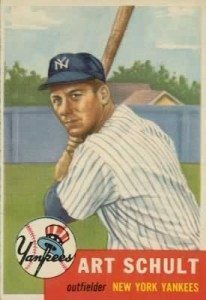 Art Schult got only the briefest chance to catch on with the 1953 Yankees. In his “cup of coffee” with manager Casey Stengel, does Schult have a memory of the Hall of Famer? Most incredible is Schult’s recognition of his 1953 Topps card. Some collectors have guessed that Topps painters inserted random backgrounds on some cards. I thought Schult’s card looked like my backyard! 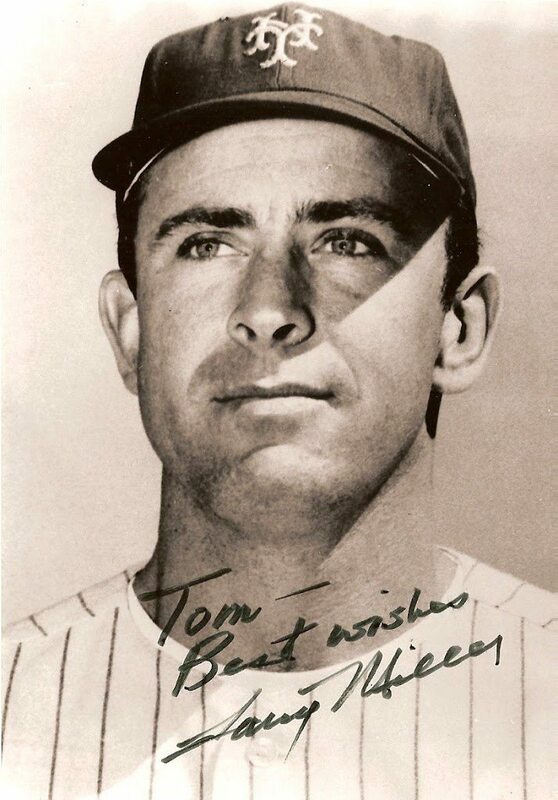 “My contract was brought up to New York at the end of the 1950 season. I was drafted into the Service roughly the same time. The only picture they had was taken in Binghamton, New York, with the center field wall in the background. Tomorrow: Remembering my conversation with Hall of Famer Johnny Mize. Did Bud Harrelson want to play for the San Francisco Giants? I quoted to him from The Ballplayers, a 1990 reference book. This was repeated in a thorough SABR biography. The Ballplayers did point out one epic week in Harrelson’s career. 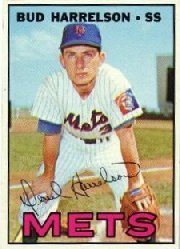 In the same week in late 1966, he secured Met wins against the Giants and Pirates with dramatic steals of home. The losses dashed pennant hopes for both clubs. Why don’t we see more steals of home today? Harrelson learned to switch-hit after struggling to hit his weight in 1965. I enjoyed discovering the Ultimate Mets Database entry for Harrelson. Be sure to check out the fan memories section, too.